with knees bent at the edge of the seat. and feet flat on the vehicle floor board. If the answer is "No" to any of these parameters, then the child should be using an approved safety seat. Planning a family vacation can be overwhelming, especially when you have young children. Rockabye Baby Rentals offers a great solution for busy parents. Rent the crib, highchair, stroller, toys and more! We deliver to hotels, vacation rentals and private residences, so everything is waiting for you to use when you arrive. Renting is affordable and eases the stress of traveling with young children. We serve Houston and Galveston TX, New Orleans LA, Fort Lauderdale, Miami, and Palm Beach FL. Fully cleaned and sanitized crib rentals, highchairs, strollers, swings, toys and more. So, whether your vacation takes you to the beach, the city, or to grandma’s house; Rockabye Baby Rentals provides everything baby needs for only when you need it. Where to Rent Car Seats? 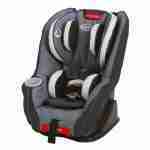 Baby Equipment rental services a great choice when considering where to rent car seats. These companies are located throughout the US. There is a misconception that only car rental agencies offer car seats to rent, that is not the case. These local baby gear rental companies tend to provide more selection at better rates. They offer car seats for children of all ages, from babies to big kids. In addition, most have both budget and high-end carseat options to cater to all families. Thus, allowing the customer the ability to choose. Safety is not only important for car travel, it’s the law. It’s important that your child is secured in an appropriate safety seat in any vehicle when traveling. So, know that you have options when asking, “Where to rent car seats”. Continue reading for actual rental options.